Northern Ireland’s MLA Minister of Enterprise, Trade and Investment Arlene Foster made a guest appearance at the HPE Africa stand to show her support for McCloskey - a Northern Ireland-based global leader in the manufacture of crushing, screening and handling equipment. HPE Africa is the sole Southern African distributor for McCloskey, and general manager Neil Sauls states that the company displayed a selection of jaw crushers and screens - which are particularly well suited to mining applications. "The McCloskey range of jaw crushers and screens are internationally recognised for their quality and reliability, and were well received by our guests." HPE Africa is also the sole distributor of Hyundai earthmoving equipment in Southern Africa, and the company exhibited and demonstrated the capabilities of 14 Hyundai machines at bauma, including mini excavators, backhoe loaders and wheel loaders. According to Sauls, the Hyundai range of backhoe loaders was particularly well-received by visitors from the Eastern Cape, a region that has been specifically targeted for growth by HPE Africa. “The Hyundai backhoe loader range is ideal for smaller or start-up businesses that do not require large and costly earthmoving equipment from the outset." Many smaller businesses in the Eastern Cape only require a smaller machine such as a backhoe loader during the early stages, before moving on to larger excavators and loaders when they obtain larger contracts. Sauls believes that the Hyundai H930s and H940s backhoe loader range will perform well in this market through HPE Africa's Port Elizabeth and East London branches. “HPE Africa is offering a product that matches the leading brands of backhoe loaders in terms of functionality and technical capabilities. The Hyundai range is competitively priced and is backed up by HPE Africa’s unrivalled after-sales and technical support, which I believe will play a major role during the customer’s purchasing decision,” he continues. 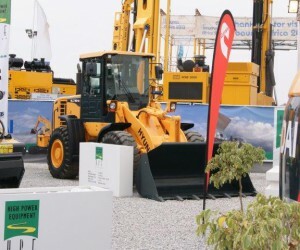 What's more, HPE Africa also demonstrated its range of Astra articulated dump trucks (ADTs) and rigid dump trucks (RDTs) at its 1 215 m2 exhibition area. “The Astra range of ADTs and RDTs have developed a reputation for being able to haul various loads at African mining projects that are located in harsh terrain, and subject to extreme temperatures." Given the positive feedback and numerous enquiries received from guests at bauma, which was hosted at the Gallagher Convention Centre in Midrand in September 2013, Sauls concludes by adding that he is optimistic of the prospect for long term growth for HPE Africa.